The electronics retailer has cleaned up its act, and it shows: profits are up, sales are up and now it reckons it's going to sell a million tablets. 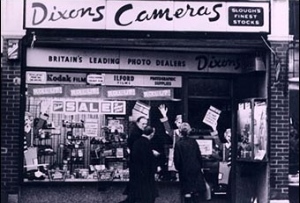 We’ve said before that in the war of the high street electronics retailers, Dixons is the last man standing. And it’s in rude health (or the rudest health it has been): having absorbed bitter rivals Currys and PC World (and with Comet out of the picture), the company has divested itself of Pixmania and Electroworld - as close as electronics retailers get to Coleridge’s Albatross. Now, it reckons it’s going to sell a million tablets over the Christmas period. Not bad. Compare Dixons with five years ago, and it’s easy to see why it was in trouble: not only was it more expensive than online rivals, but its stores were depressing and the people manning the tills didn’t exactly inspire confidence. Five years on, though, and its transformation is all but complete: it has smartened up its stores, smartened up its staff (or recruited smarter staff, anyway) and its prices are, in many cases, similar to Amazon’s. Admittedly, the retailer posted losses after tax of £83.5m, but those were associated with the Pixmania/Electroworld disposals, which racked up total losses of £95m. But like-for-like sales also rose by 9% in the six months to the end of October (although that accelerated to 12% in the second quarter). Underlying pre-tax profit more than doubled, from £14m last year to £30.2m this year. Alas, not everyone is convinced: shares dropped by more than 2.8% this morning, presumably on the news of that loss, and because shareholders were disappointed not to receive a dividend, despite its strong performance. But chief executive Sebastian James insisted that things, in the words of 90s band D:Ream (in which, incidentally, TV science gasper Professor Brian Cox was the keyboard player), can only get better. That’s the spirit. The only worry now is that lack of dividend: once that returns, we’ll be in business.